How Do You Spell P? 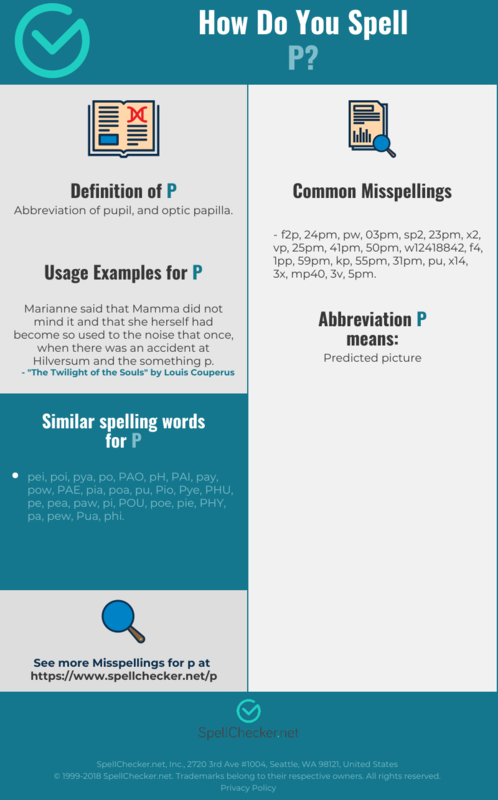 Correct spelling for the English word "P" is [p_ˈiː], [pˈiː], [pˈiː]] (IPA phonetic alphabet). 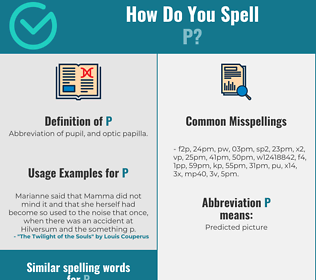 Below is the list of 228 misspellings for the word "p". Abbreviation of pupil, and optic papilla. Immunity is obtained by introducing the P. bigeminun into the blood, either by placing a few virulent young ticks upon the animal, or by repeated inoculation with a very small quantity of virulent blood. - "Common Diseases of Farm Animals" by R. A. Craig, D. V. M.